Linfield boss David Healy believes rival defenders are living in fear of his livewire striker Paul Smyth. Smyth excelled once again for the Blues in Tuesday night’s County Antrim Shield win over Carrick Rangers. The 18-year-old teed up Niall Quinn for the opening goal, while his energy and pace helped win a first-half penalty. On another night Smyth could have been on the scoresheet himself, but Healy – Northern Ireland’s record goalscorer – believes it is only a matter of time before the teenager starts finding the net on a regular basis. “Paul is good player, and good players don’t sense fear.The only thing missing for him is a goal. But that will come,” Healy said. “I saw Paul playing for the Swifts and I thought he had something different. “During a turbulent month of November, he was a shining light for us. “We won’t get carried away with him. We will help and support Paul, and encourage him. “I have spoken with him on many occasions. His performances are giving defenders headaches. He has pace, which I never had, and he threatens defenders by coming short and running at them. Healy believes Smyth’s pace and tenacity will stand him in good stead in the Premiership this season. “He dragged the team forward against Carrick. He is always looking for that run behind the defence, and in the first half it was his energy and desire that got him into good positions,” Healy added. “And then he set up Niall (Quinn) for the first goal. He did well to get to the line and he picked out the right pass for Niall to score. “Paul has pace and awareness, and when you are quick you will cause problems for defenders. Healy is now looking forward to his first cup final following Tuesday’s 2-0 win over Carrick. Ballymena United lie in wait in next month’s decider, which will be played at Linfield’s Windsor Park home. The venue was decided following a coin toss on Wednesday night. “It was a good win for us against Carrick. If we had turned up and played rubbish but won the game, that’s all that would have counted. 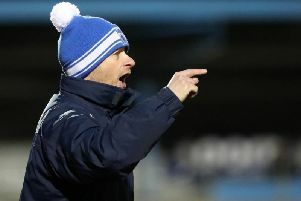 Reaching a cup final was key,” Healy added. “But I thought our overall performance was good. “I am delighted to reach a cup final. Winning trophies is the demand put on you at Linfield. You have to be contesting every competition. “I understand the pressure, and it is a cup final to look forward to. Meanwhile, Crusaders have been granted planning permission for a new modern stand at Seaview. At Belfast City Council’s planning committee meeting on Tuesday night, the green light was given for a proposed new 1246-seater facility at the Danske Bank Premiership champions’ Seaview ground.